This report is produced by OCHA Libya in collaboration with humanitarian partners, covering the period of 5 to 7 April. The next report will be issued on or around 10 April. · The United Nations and the humanitarian community were able to deliver life-saving humanitarian aid through a World Food Programme-chartered ship which has docked at Misrata port on 7 April. · A temporary cessation of hostilities has been urgently called for by the United Nations Secretary- General Ban Ki-moon and Under-Secretary-General for Humanitarian Affairs and Emergency Relief Coordinator Valerie Amos. · The presence of landmines, abandoned munitions and unexploded ordnances inside Libya pose a serious threat to civilians. 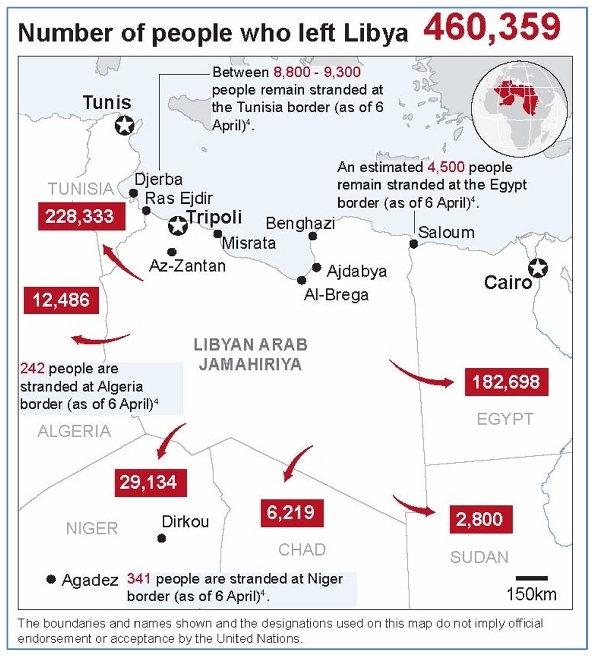 · The US$ 310 million Flash Appeal for the Libyan Crisis is currently funded at 39 per cent with US$ 120 million committed and US$ 1.4 million in pledges. There remains a dire need for further access and humanitarian intervention in conflict-affected areas in northwestern Libya, and particularly in Misrata. Intervention in the health sector and regarding the protection of civilians are needed urgently. 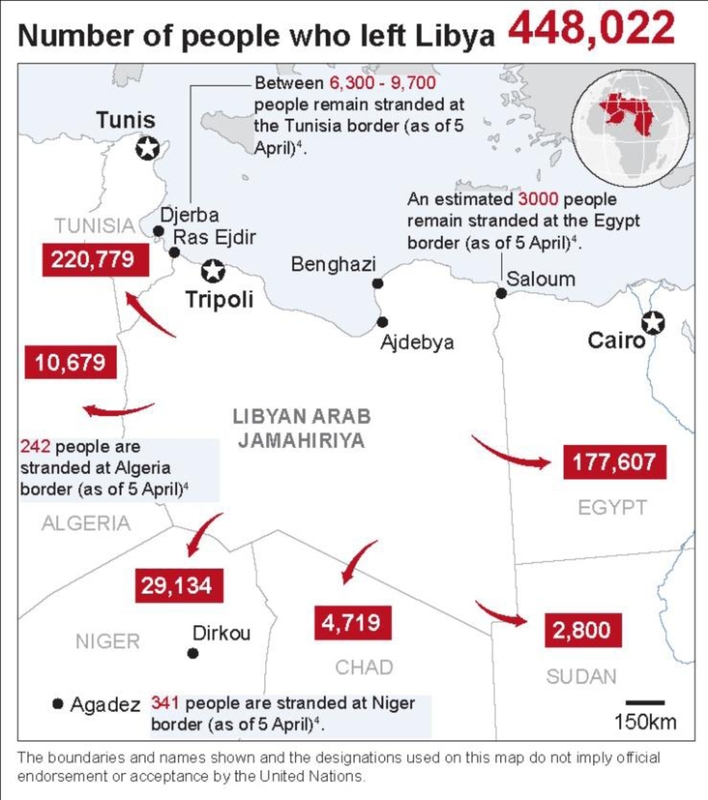 Between 13,200 and 13,600 people remain stranded at camps and transit points in Tunisia, Egypt, Niger and Algeria. In addition to the huge constraints being placed on large numbers of refugees and internally displaced persons, ongoing fighting has placed enormous strain on medical supplies, equipment and specialist personnel. This resulted in large areas contaminated with landmines. There are reports that Libyans are removing landmines by hand and that 40 anti-tank and 26 anti-personnel mines have been removed near Ajdaibya. Unexploded ordnance (UXOs) pose a greater problem as do abandoned weapons and like landmines, require specialised equipment and personnel for safe removal. There is a need for community-based communication campaigns to appropriately sensitize populations on the dangers of landmines, unexploded ordnance and abandoned weapons. There is also a need to conduct assessments, including recording and documenting of these new mines. There is no effective coordination for reporting, recording and documenting identified landmine and OXO hazards within the country due to the security situation in Libya. There is a lack of available capacity to effectively mitigate this threat. The Union for the Mediterranean promotes economic integration and democratic reform across 16 neighbours to the EU’s south in North Africa and the Middle East. Formerly known as the Barcelona Process, cooperation agreements were re-launched in 2008 as the Union for the Mediterranean (UfM) . The re-launch was an opportunity to render relations both more concrete and more visible with the initiation of new regional and sub-regional projects with real relevance for those living in the region. Projects address areas such as economy, environment, energy, health, migration and culture. Along with the 27 EU member states, 16 Southern Mediterranean, African and Middle Eastern countries are members of the UfM: Albania, Algeria, Bosnia and Herzegovina, Croatia, Egypt, Israel, Jordan, Lebanon, Mauritania, Monaco, Montenegro, Morocco, the Palestinian Authority, Syria, Tunisia and Turkey. Currently meetings are co-presided over by one Mediterranean and one EU country. As of September 2010, the UfM also has a functional secretariat, based in Barcelona, a Secretary General and six deputy secretary generals. Following the entry into force of the Lisbon Treaty, governance from the EU side will be rearranged once the EEAS has been established. the Mediterranean Business Development Initiative, which supports small businesses operating in the region by first assessing their needs and then providing technical assistance and access to finance. You are currently browsing the archives for the EUROMED category.